InCubando fellows Marta Elisa Deus (left) and Javier Puig on the FIU campus. "I saw all the changes in the law there for the private sector," says Marta Elisa Deus, referring to the free-market reforms that Cuban leader Raúl Castro had in full – if halting – swing by then. Deus and her family had left Cuba when she was 12. So, full of curiosity about her past, she crossed the pond again to find, ironically, opportunity on her birth island. "I decided to open my own business," she says. Not just any business. Deus started one of the first accounting and financial services firms for Cuba’s other half a million private companies. It’s called Deus Accounting Experts. Three years after its launch, her three employees make many times the $20 monthly salary most Cubans earn – and Deus is wearing the same power business suits she would have sported back in Spain. InCubando is the first college-based business education program in the U.S. expressly for Cuba’s fledgling business owners. It’s the brainchild of Roots of Hope – a Miami-based group that promotes outreach between Cubans and Cuban-Americans – and FIU’s Cuba Research Institute and College of Business. “We are trying to learn from them how they have been doing business in Cuba in a planned economy," says Carlos Parra, an FIU marketing and information systems professor and an InCubando director. That can involve high-level, MBA-style theory like pro-active stakeholder engagement. (Managing your relationships with customers, employees, suppliers and regulators.) Or simpler things – such as teaching the Cuban fellows that in capitalist economies like the U.S. we usually don’t have to ration basic goods, a lesson they learn on their first visit here to Publix. “One of them was very interested in getting a lot of boxes of plastic utensils," Parra recalls. Still, Parra says, FIU profs are surprised at how much the Cuban entrepreneurs have learned about business by doing business in Cuba. They’re especially impressed by their sense of how to tailor products to customers’ needs. A good example is a 33-year-old industrial engineer named Javier Puig, who recently started MCG Technologies in Havana. He’s developed software – called Open Opportunity – that he says gives companies new ways to integrate management systems. "I think I have something very vanguard and innovative," says Puig. As Puig explains his product, he makes another noteworthy observation: He’d like to be Cuba’s version of a software innovator like billionaire Microsoft founder Bill Gates. 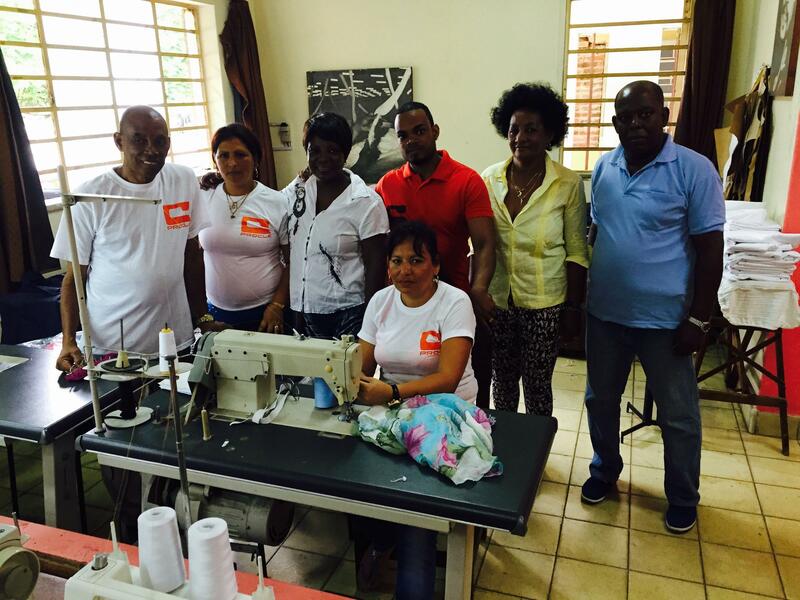 InCubando fellow Oscar Matienzo (in red shirt) with employees and his family at their clothing company, Procle, in Havana. Problem is, the Cuban government isn’t quite ready for a Cuban Bill Gates – which is why Puig is still waiting for a license to sell his software. So he’s taking advantage of InCubando to build his business savvy – and make business connections in Miami on this, his first trip ever outside Cuba. Deus feels the same way.